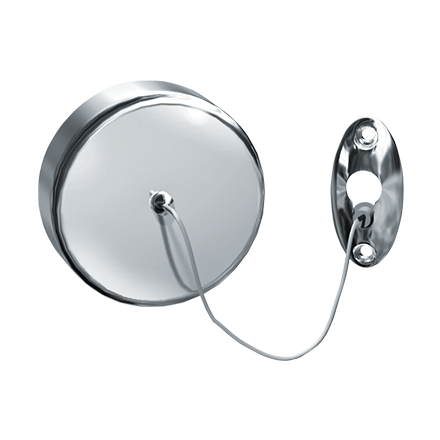 Includes cord cover plate, locking nut and knob retainer – stainless steel with bright finish. Nylon gaskets are supplied to isolate flanges from finished wall surface. Unit includes spring actuated reel with 72″  vinyl covered cord. Cord knob is white vinyl. Locking knurled nut to hold stretched line taut is also provided on cord cover. Installs over bathtub or in shower. The clothes line is retracted into the cover plate mechanism by first releasing the locking nut and then removing the cord knob from the knob retainer, thereby allowing the spring mechanism to automatically retract the clothes line. 6ft. Max Space between opposite faces of finished walls.